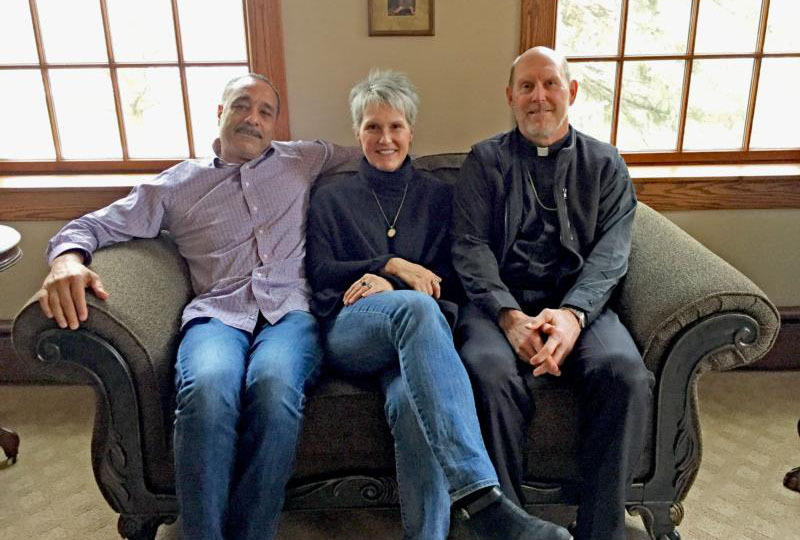 DAVENPORT (CNS) — As he and his brother bishops voted on a new pastoral letter on racism at their fall general assembly in Baltimore, Bishop Thomas R. Zinkula of Davenport reflected on how racism impacted his family in rural Iowa. It got him to thinking about how Pope Francis encourages Catholics to “Share the Journey” with immigrants and refugees. Get to know their stories, change perceptions, the pope said. That message applies to other groups as well, Bishop Zinkula said. “It’s one thing to talk about a problem. It’s another thing to meet real-life people and hear their stories. Our family’s story would be an example,” he told The Catholic Messenger, Davenport’s diocesan newspaper. Sharon Zinkula, a younger sister of then-seminarian Thomas Zinkula, began dating her future husband, Joseph Flowers. The Zinkulas are white; Flowers is black. The tense situation dragged on for three and a half years because “I just didn’t want to approach it again. I didn’t know how to approach it again,” Sharon said. Her mom told her that periodically she’d go to a priest to talk about the situation. Sharon chose not to bring Joseph home. “I wouldn’t subject him to that,” she said. “I remember receiving a letter from Tom during the period between telling Mom and Dad about Joseph and when they met him. Tom was spending the summer in New York at Covenant House. I think I wrote him because I was wondering if I was doing the right thing — or wanted reassurance I wasn’t doing anything wrong. Bishop Zinkula remembers writing that letter. “I was kind of challenging her. Sharon is idealistic. … She cares about everybody and about social justice.” He wanted Sharon to think about her motives. Was she dating Joseph because of her world view or because she was attracted to him? A watershed moment occurred in November 1991, Sharon said. “My sister (Sandy) was getting married and she and her finance went up to Dad and Mom and said, ‘We’re inviting our friends to our wedding. We consider Joseph a friend. Do you have a problem with us inviting Joseph?” No, they did not. Sharon and Joseph, who is not Catholic, married in a civil ceremony in 1995. A church ceremony took place in 1999, with her brother Tom, by then a priest, leading the service. It was the first time that “my dad and Joseph’s mother met. Joseph was really nervous about that,” Sharon said. But the in-laws got along well. “After that it was like no big deal. Joseph was part of the family. It took many years to get to this place,” Bishop Zinkula said. The birth of Sharon and Joseph’s daughter, Lauren, now 18, also “softened things a bit,” he added. Race will always be part of the equation for Sharon and Joseph. “We’ve been together for 30 years; the only thing I can say for certain after all of this time is that it’s impossible for me to know what it’s like to be black,” Sharon said.